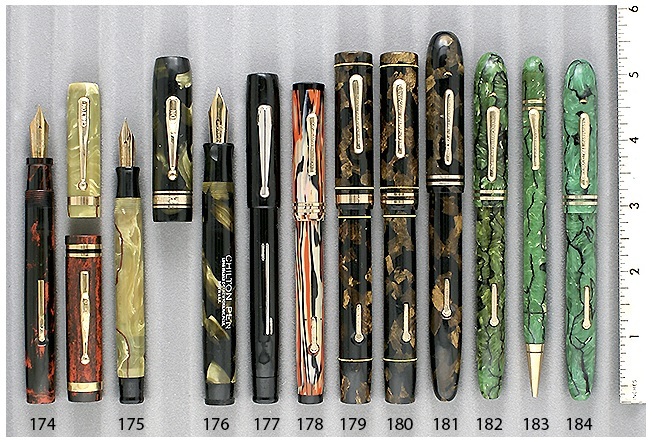 Pen #178 from our Catalog #74 is the Conklin Halloween. This 1927 pen is composed of ivory, orange, and black veined celluloid. The lever almost blends into the finish. This model is highly desirable, and it is quite beautiful, as well as rare. This Halloween is equipped with a #2 fine, flexible nib. This is a really gorgeous and unique vintage pen – the celluloid colors are not clownish at all. They may be wild and eye-catching, but not undesirable. This finish has been remade in the modern Conklins, but I must admit, I prefer this version. This entry was posted in Vintage Pens and tagged Conklin. Bookmark the permalink. Follow any comments here with the RSS feed for this post. Post a comment or leave a trackback: Trackback URL. Hi is the N 178 on sale? I have a shipping address in Seattle.